Davide Balliano's work stems from his research of the existential issues of man and his relationship to the sublime, through an austere and minimal language of abstract geometries in strong dialogue with architecture. His practice is primarily manifested as painting and sculpture. Born in Turin in 1983, Balliano lives and works in New York since 2006. He works with Tina Kim Gallery, New York and Luce Gallery, Turin. 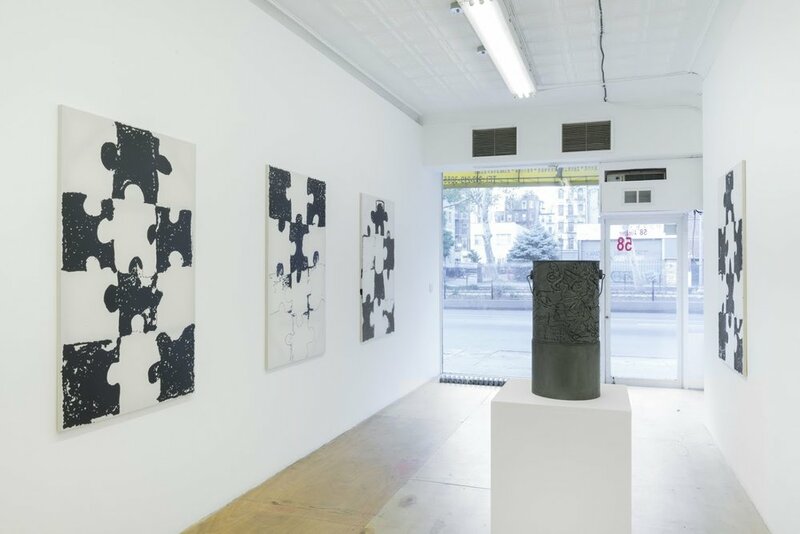 Recent solo exhibitions include Tina Kim Gallery, NY (2017), Luce Gallery, Torino (2017-2015), Timothy Taylor, London (2015), Room East, NY (2014), Rolando Anselmi Galerie, Berlin (2014 - 2012), Galerie Michel Rein, Parigi (2013). 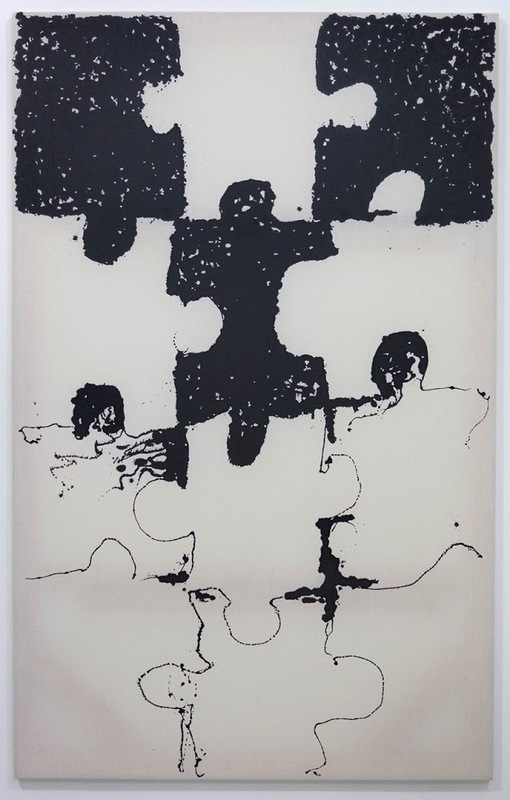 His works has been included in group exhibitions at David Zwirner Gallery, NY (2015), Sean Kelly Gallery, NY (2014 - 2010), Museo Madre, Napoli (2012), The Watermill Center, NY (2011), MoMA PS1, NY (2010), Espace d'Art Contemporain de Castello, Castellon, Spain (2010). 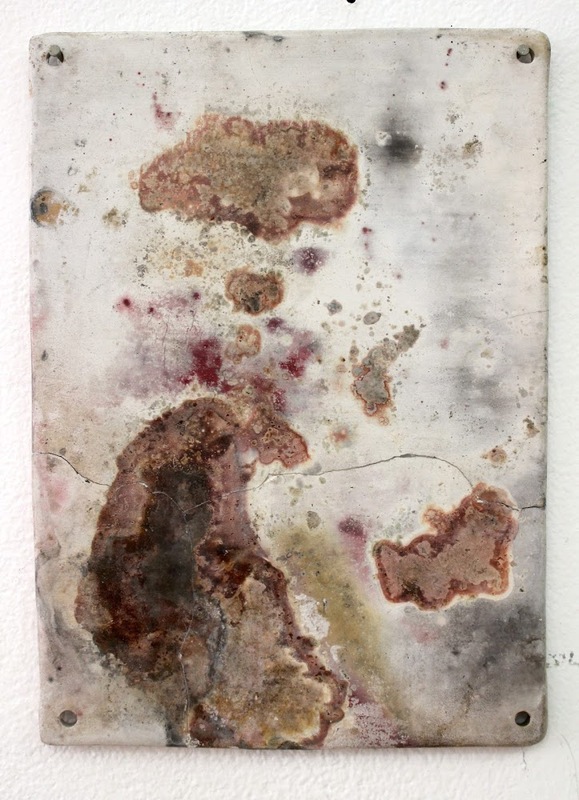 Lukas Geronimas’ work is an examination of content-support dynamics, through the use of readily available materials, crafted to express an array of formal strategies. Born in Toronto in 1980, he is of Lithuanian heritage and lives and works in Los Angeles. Notes on work in this show: For ‘Ink Drip Puzzle Piece’s, custom low profile strainer bars made of maple and cedar are built by the artist, and muslin is stretched and glued to the bars. Ultrablack Ink is dripped onto the surface, and guided by a finger to fill voids. The ink pools, and occasionally drains through spots that are made porous on the muslin. When the ink dries, all the marks settle into themselves, and the end result is a drawing technique that emulates a print. The puzzle motif is, well... pieces. ink and graphite powder. 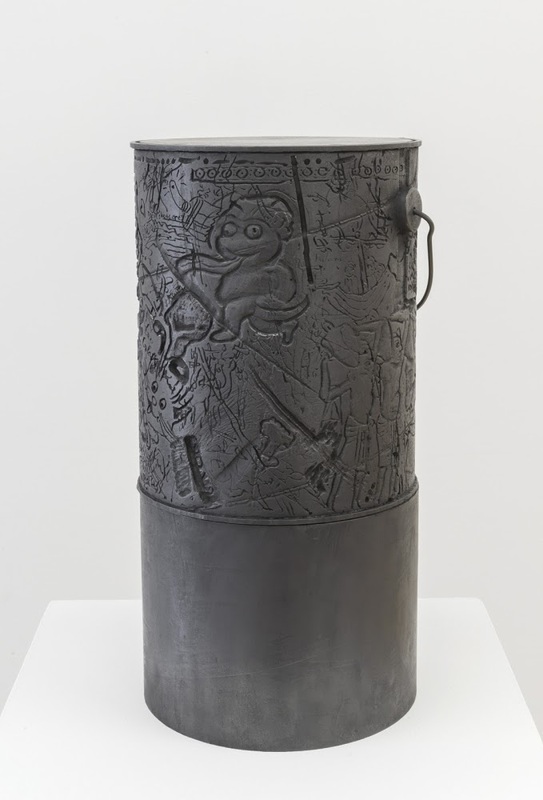 Each can is meant to exist on its own as a discreet work, and so the carved composition the variety of marks and subject matter the artist considers necessary to include. The can is a little bigger than a paint can’s standard dimensions. Recent solo solo shows include 247365, NY (2016), The Landing Gallery, LA (2016), David Petersen Gallery, Minneapolis (2015). 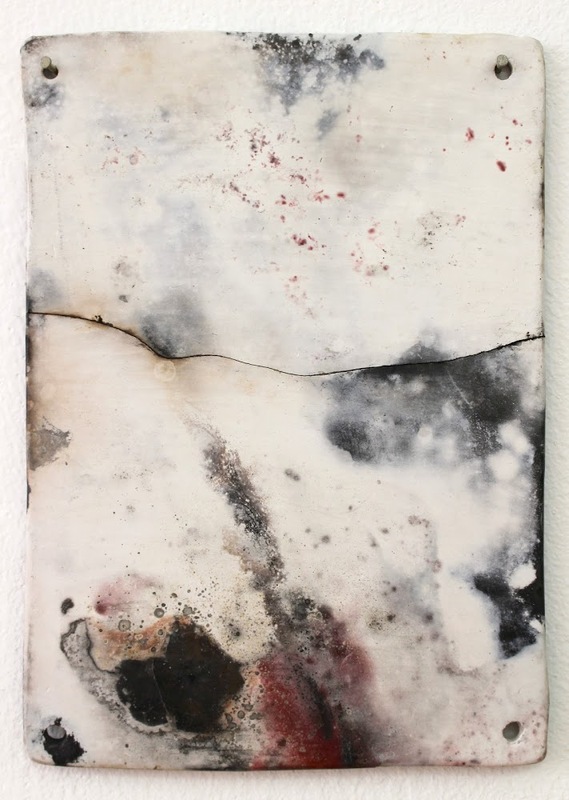 His work has been included in group exhibitions at Parker Gallery, LA (2017), Gillmeier Rech, Berlin (2017) Andrea Rosen, NY (2015), Cooper Cole, Toronto (2014), Housatonic Museum, Connecticut (2012). 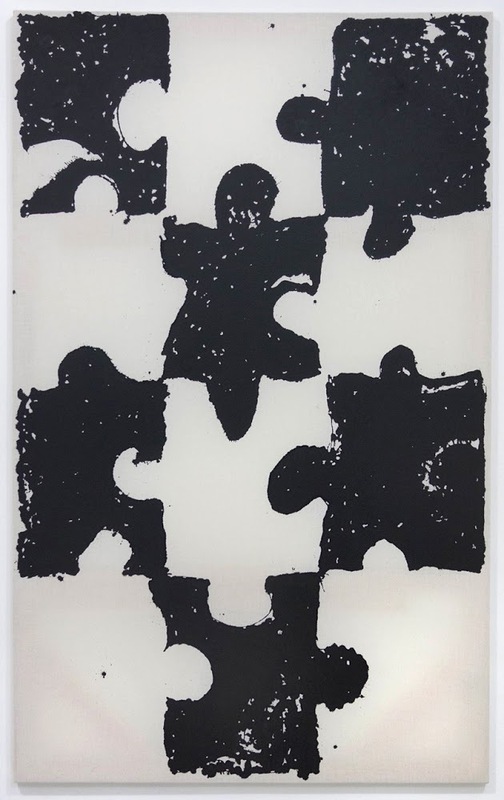 Geronimas is represented by Parker Gallery, Los Angeles. Bringing together prehistoric technology and contemporary ceramics, for the past year and a half, Leah James has been choreographing controlled outdoor pit fires to create her new work. 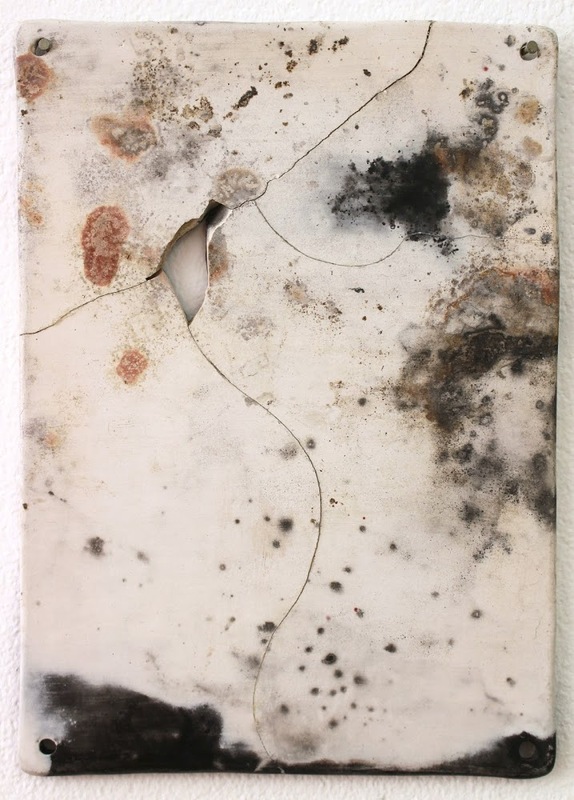 The firing and the preparation of the kiln are a performance, documented by the resulting 5.75 x 8.75 inch finished clay slab “paintings.” Each piece becomes unique during the firing. As chemicals oxidize and are absorbed on the surface, a range of colors and shapes are deposited upon the hand burnished stoneware from different combustibles; banana peels cause grey and blue marks, fine black lines are created by burnt hair, and sawdust causes planar and irregular black shapes. 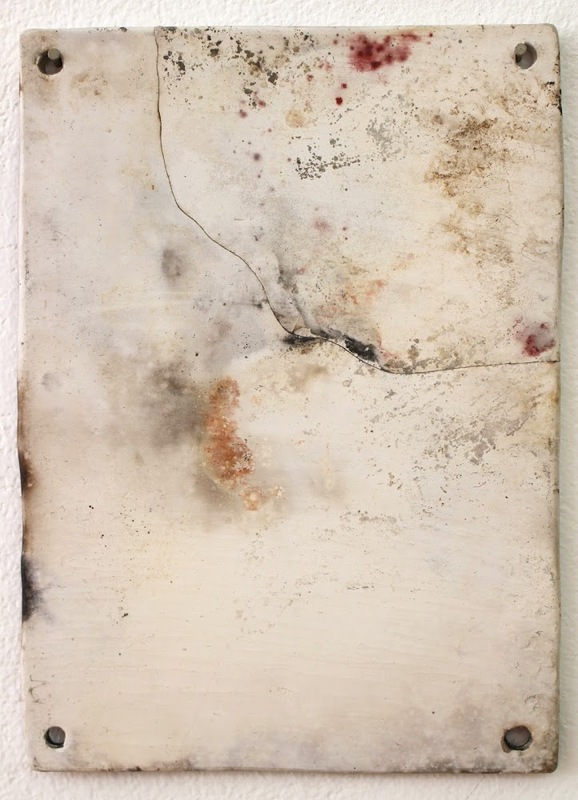 This process has affinities to exposure in photography but instead of light, exposure to heat and chemical oxides create a range of marks, colors, shapes, and cracks on the bare clay surface. The slabs become objects for looking and seeing, recollecting the process of the performance and our relationship to the Earth’s materiality. Leah James, (born 1983, Perth, Canada) received her BFA from the University of Waterloo, (2006) . 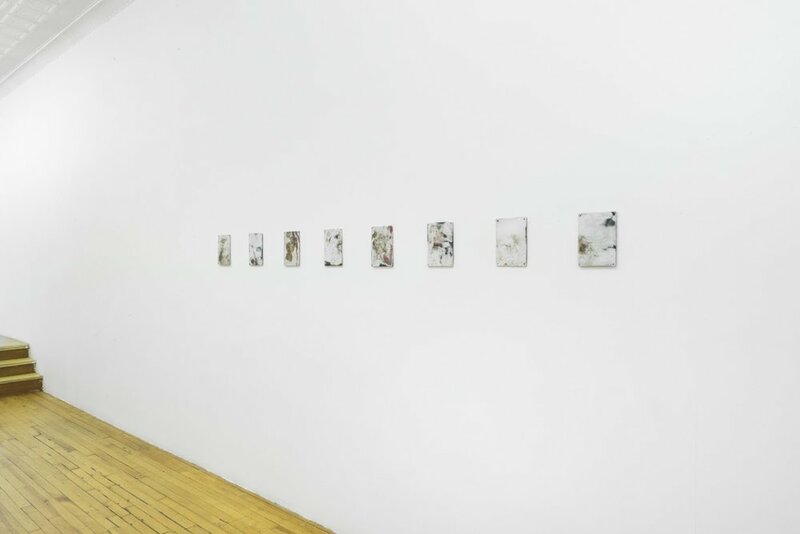 Her work has been exhibited at Riverside Art Museum, Riverside, The Meisterhaus Kandinsky / Klee, Dessau, Katherine Mulherin, New York, Erin Stump Projects, Toronto, and most recently, at Greenpoint Hill, Brooklyn. She has received grants from the Ontario Arts Council, and the Premier's Award for Research Excellence (PREA). 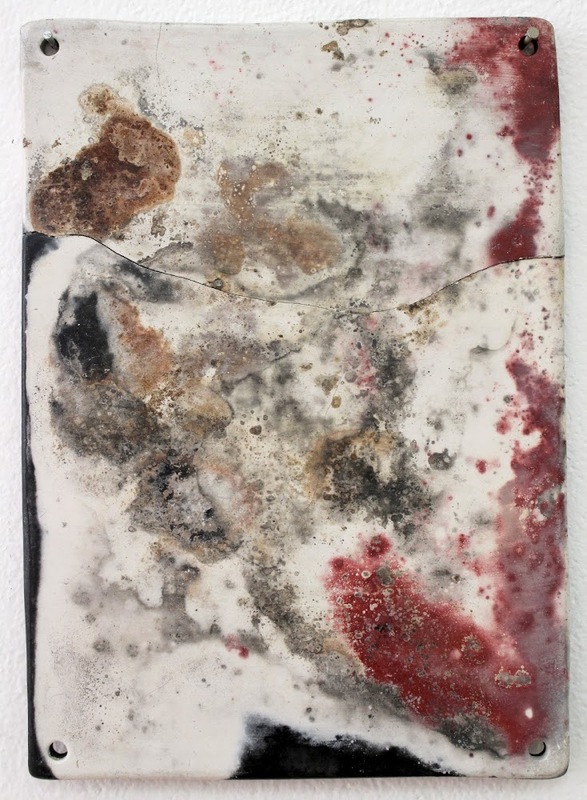 She has participated in several residencies including Painting's Edge Residency, Idyllwild, CA, and The New Research in Abstraction Fellowship at the University of Waterloo. Leah lives and works in Brooklyn.